by Travis Atkinson, LCSW, USA. Challenges in the treatment room are constantly present for the individual therapist. These may include obstacles to developing and maintaining a strong therapeutic alliance, barriers to the ability to empathize with the client, and hurdles in working with the client to establish goal consensus and collaboration during treatment. With two clients in the room, double the possibilities for obstacles, and the challenges faced by the therapist working with a couple become more apparent. Couples often enter therapy as a last resort to save their marriage or love relationship, when problems may seem nearly irreconcilable. John Gottman’s research shows that the average couple enters treatment six years after their distress began, with numerous experiences in that time reinforcing their distress (Gottman, 1999). Second, the couples therapist must face partners having different motives for seeking therapy, with one or both usually seeking validation from the therapist that the other partner is the source of the distress. Third, the motivational level to seek and pursue therapy usually differs between partners, with the more engaged partner usually willing to complete tasks. In contrast, apartner in a detached protector/self-soother mode may feel like he or she is being dragged into the process after the more engaged partner begins to sink into despair. 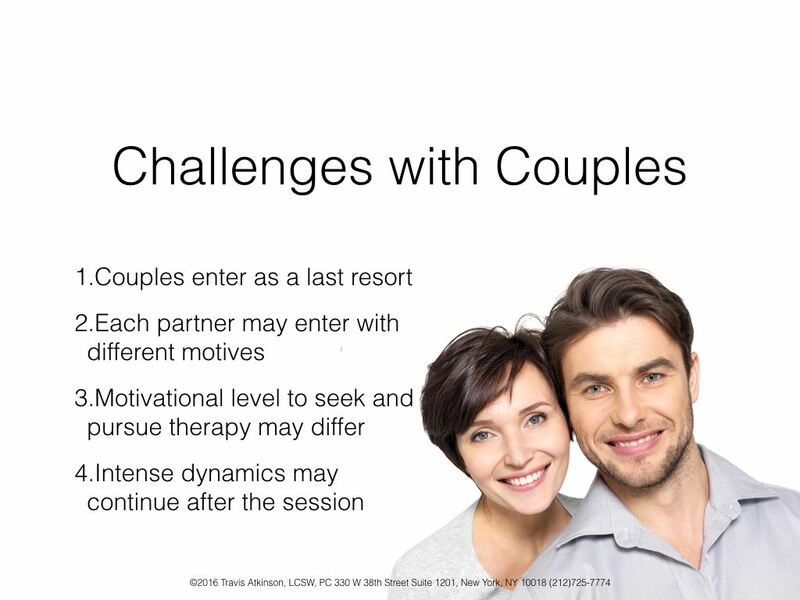 Finally, the couples therapist also struggles with the challenge of working with often emotionally intense dynamics in the treatment room which the couple can easily carry with them outside the office setting, potentially threatening the continuation of treatment (Norcross, 2011). Of the many hurdles the couples therapist faces, one of the biggest threats to successful outcome lies in a rupture to the therapeutic alliance. The therapeutic bond between clients and therapist stands out as crucial to successful couples therapy, along with the treatment methods used, the characteristics of the client, and the qualities of the therapist (Norcross, 2011). When tension or breakdowns in the therapeutic relationship occur, the success of the treatment often diminishes, and failure to resolve the ruptures may lead to the end of couples therapy. Perhaps a surprise to many therapists is how often ruptures occur in treatment. In standard individual psychotherapy, 37% of patients report ruptures during the first six sessions, while 56% of therapists report the same (Norcross, 2011). 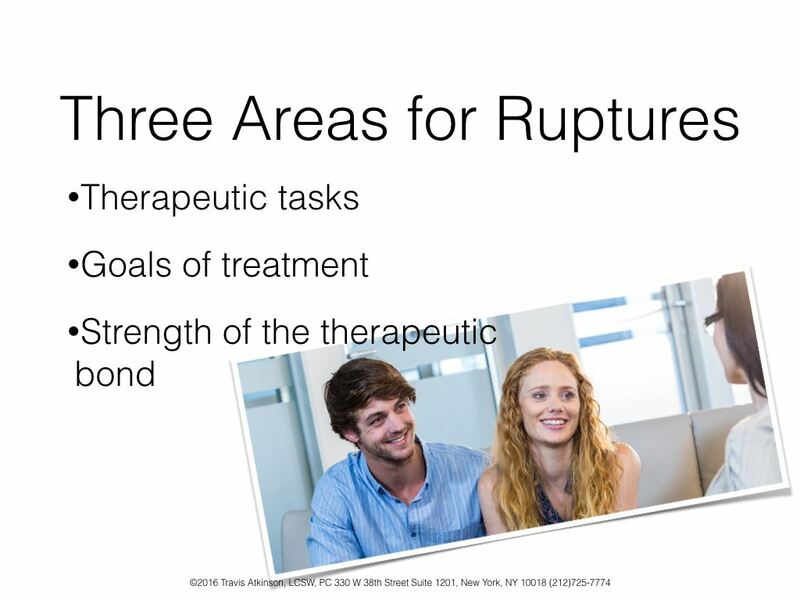 Schema therapy’s focus on more challenging populations may increase the likelihood of activations, and working with two partners instead of one may also lead to more ruptures during treatment. Partners who have experienced trauma often present with personality disorders that make a connection with the therapist take longer to form, and require more transparency and collaboration from the therapist (Furrow, Johnson & Bradley, 2011). The effective schema therapist anticipates ruptures based on a thorough assessment of both partners’ schemas and modes in the first phase of treatment. He or she works to repair these ruptures with each partner, and views them as opportunities to fulfill unmet needs. The result is a strengthened therapeutic bond (Atkinson, 2012). Ruptures in couples therapy can be centered around three key areas of the work: each partner’s sense of the therapeutic tasks, the goals of treatment for the marriage or love relationship, and the strength of the bond between the therapist and both partners (Norcross, 2011). Therapeutic tasks may be challenging when a therapist insists on only doing one type of intervention that is not a good fit for a partner, rather than being flexible to apply a different technique. For instance, a shy partner may be apprehensive to do chair work in the beginning of therapy. If the therapist insists on doing only this technique, rather than preparing the partner more by using alternatives to build-up to chair work, the partner may feel a sense of emotional deprivation. 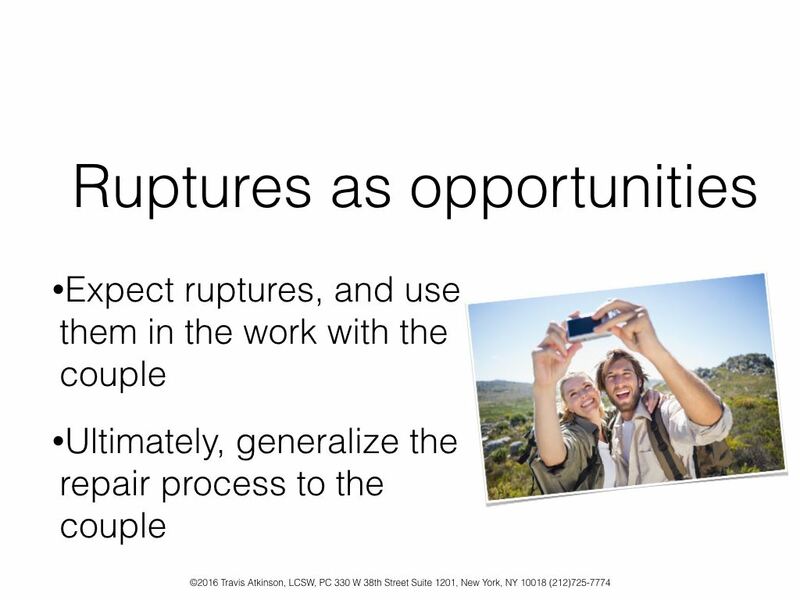 The goals of treatment can be another area for ruptures to occur, such as when one partner solely wants to focus on demonizing the other partner, and is not open to viewing the problems within the relationship as involving both partners. How the therapist manages the partner’s expectations can lead to a rupture in the alliance that the therapist will need to repair. The strength of the bond between the therapist and both partners is constantly being tested, and ruptures may occur whenever a schema or mode is activated. Schema eruptions remain possible throughout treatment, and a therapist who is aware of each partner’s core schemas will be able to anticipate when ruptures are likely to occur. For instance, a partner with a high emotional deprivation schema may expect that the therapist will not understand him or her, and may be extra sensitive to the possibility of the therapist favoring or siding with the other partner. A partner with a high mistrust/abuse schema will likely have more fears and negative perspectives about the therapeutic process, and the prepared schema therapist will anticipate ruptures around his or her mistrust and his or her prototypical mode connected to the schema. The schema therapist identifies the primary schema(s) involved in the rupture, and differentiates between a linked child mode, parent mode, and coping mode to address the tension with an appropriate response (Simeone-DiFrancesco, Roediger & Stevens, 2015). Talking through the negative feelings about the therapist or the therapy process while the schema therapist remains open and non-defensive, owning his or her part of the breakdown, can serve as a model for conflict repairs in the marriage or love relationship. The schema therapist understands the challenge the client may have faced to bring up the tension with him or her (as an authority figure), and encourages the client to express his or her thoughts and feelings about the therapeutic relationship. Together, as the rupture gets repaired, both the therapist and partner work to generalize the repair process to the couple’s dynamic. The schema therapist links past relationships when ruptures occurred to the current situation, using caution to not overuse this connection. For effective treatment, the quality of the associations from past relationship experiences may be more important than the quantity (Norcross, 2011). How the schema therapist collaborates with the client at identifying ruptures, connecting them to schemas and modes, and helping the client adapt healthy modes with the therapist and partner is crucial. The therapist works to maintain the Healthy adult’s curious, open, accepting, and loving state (COAL), as Daniel Siegel describes in a definition of how to love (Siegel, 2011). In a couple, at least one of the partners will likely push the therapist’s buttons during the course of treatment, when the therapist’s own schemas are activated. For instance, in a session when a therapist starts to feel anxious, angry, or bored, behaviors may arise while treating the couple that become unhealthy modes. Examples include the modes of detaching and becoming under-involved with one or both partners, or becoming over-involved with one or both partners in a way that becomes more about the therapist than the couple. These reactions from the therapist may be subtle, or pronounced. A maladaptive mode from the therapist often leads to the couple being sidelined. For instance, a therapist with a Social Exclusion schema may seek acceptance from one of the partners he or she perceives as socially desirable, and loose both partners in the process. However, if the therapist is aware of his or her schema and mode activations internally, he or she can identify how each partner may be triggering the internal reaction, and relate this to the work with the couple when a rupture occurs in a way that helps both partners remain on center stage, and these experiences build on the couples’ work to repair ruptures (Arntz & Jacob, 2013). 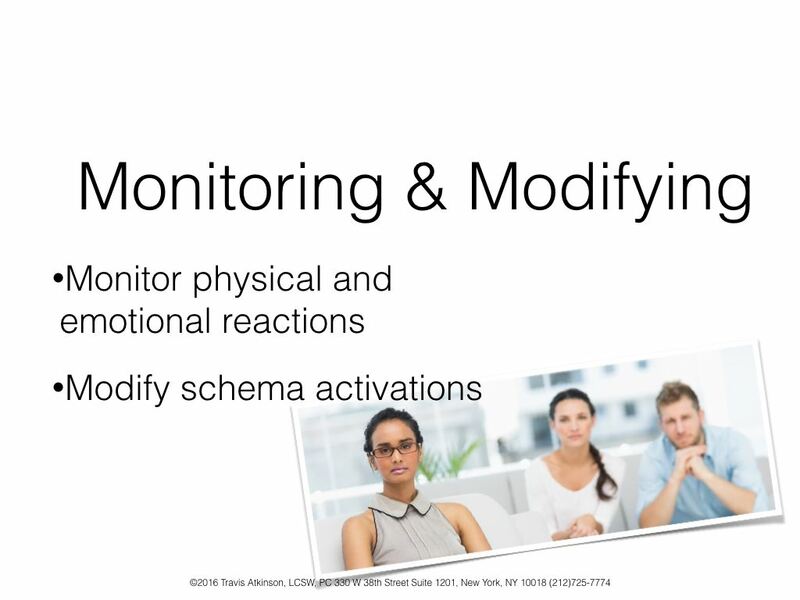 The schema therapist working with a couple uses the same techniques on himself or herself as he or she is applying to the couple through reparenting: monitoring physical and emotional reactions, and modifying the activations when noticing shifts that ignite an internal adrenaline reaction signaling a schema eruption that may lead to a coping mode. 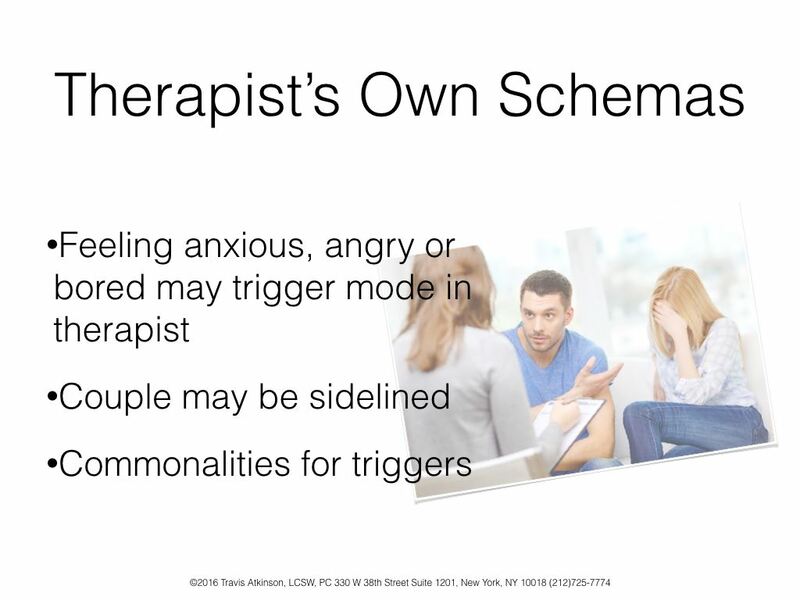 The therapist’s healthy adult mode applies soothing techniques to calm his or her internal state when schema triggers occur. Just as with couples, the schema therapist attends to monitoring and modifying internal eruptions before a state of Diffuse Physiological Arousal (DPA) sets in, when the heart rate rises above 100 beats per minute for more than two minutes (Gottman & Gottman, 2014). When DPA occurs, the therapist may have difficulty recovering from the interaction, and may not be to keep his or her social engagement system functioning. Instead of being receptive, the therapist becomes reactive, as the schema eruption entraps him or her and clouds the vision needed to be the healthy adult to the couple. When working with each partner, the therapist understands he or she is “soaking up” what the couple presents in the treatment room. With this expectation, the therapist monitors his or her five physical senses: seeing, hearing, tasting, smelling, and feeling. He or she notices more than the words of each partner, paying attention to eye contact, facial expressions, tone of voice, posture, gesture, timing, and the intensity of responses, noting activations. The therapist questions within himself or herself what his or her internal sensations may indicate about each partner and the dynamic. Additionally, the therapist attunes to each partner, focusing attention with clear perceptions so that each partner “feels felt.” When the therapist senses a schema or mode activation internally, he or she applies modifying techniques that include the meditative tools of breathing and focusing, until the therapist’s heart rate decreases enough to reflect and make sense of the interaction. Once the therapist calms his or her internal reaction, he or she responds to the partner to repair the rupture (Siegel, 2011). Through monitoring and modifying, the schema therapist is able to remain in a receptive state, applying reparenting to both partners, rather than becoming reactive (Gottman & Gottman, 2014). The therapist models a way to help each partner remain “present” in the session, being open to each piece of the puzzle rather than reacting with rigid, fixed judgements or chaotic reactions driven by his or her schemas and modes. When the therapist widens his or her openness and receptiveness to different schemas and modes, the connection with each client deepens, and each partner feels safe to respond more effectively to therapeutic efforts (Norcross, Beutler, & Levant, 2005). Particular influences are more likely present when a therapist is activated and looses his or her objectivity. Common personality disorders that challenge therapists are well-known to schema therapist’s, including the negative reactions that a partner with narcissistic personality disorder or borderline personality disorder may provoke in the therapist. Additional factors that may trigger negative reactions in a therapist include a partner with post traumatic stress disorder, suicidal or violent tendency clients, and clients who are victims of abuse (Norcross, 2011). 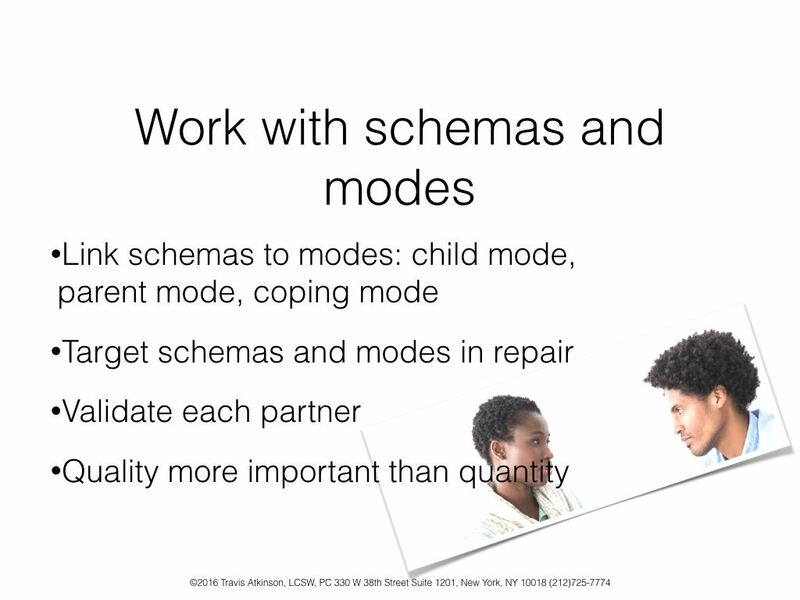 A schema therapist uses his or her understanding of each partner’s schemas and modes to work and how they may interact with his or her schemas. For instance, in a relationship dynamic, when a client expresses open hostility through an angry child or punitive parent mode, the therapist may cope through his or her own modes. A detached protector will pull for the therapist to disengage from the couple, counting the number of windows in the office building across the street during the session while the partner begins to scream at the therapist. Alternatively, if the therapist’s vulnerable child is activated, an angry child mode could quickly emerge, resulting in the therapist expressing hostility toward an already hostile partner. 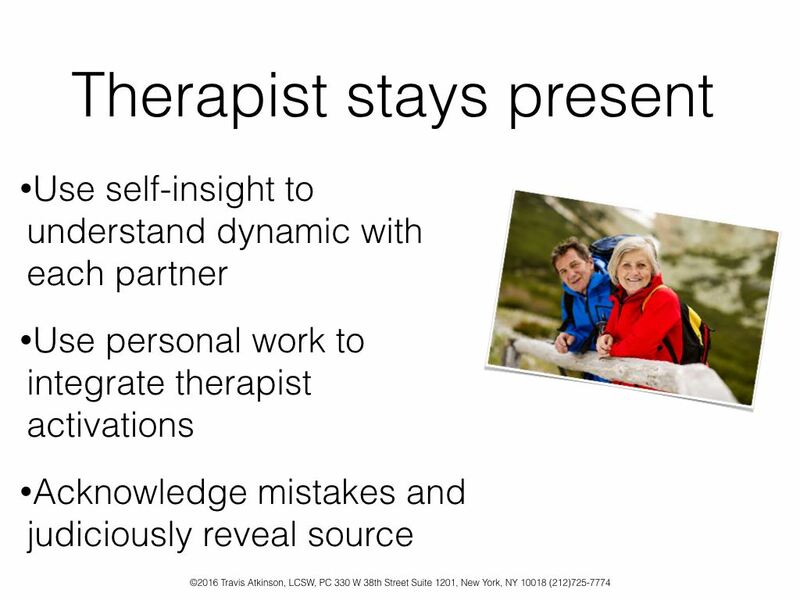 To counter this potential rupture, the therapist can use his or her self-insight into how the partner’s reaction may be related to his or her own schema activation, both in historical relationships, and with the current partner. The therapist questions when past relationships have lead to schema development, and how they may be constricting him or her in life now. The therapist also works to understand what about the partner’s modes may be activating the therapist, and if persistent or intense, pursues personal work to further heal his or her own schemas. With personal treatment, the therapist is more likely to quickly acknowledge to the couple when he or she acted in a way that may have hurt or ignored the partner (Norcross, 2011). Using self-insight, along with personal treatment as needed, the therapist is able to quickly admit mistakes, and gives meaning to the internal activations, judiciously revealing the source of the eruptions outside of the couple depending on the needs of both partners. The therapist tracks the patterns of partners who activate his or her schemas, and learns from these experiences to stay more open to couples presenting similar dynamics in the future. 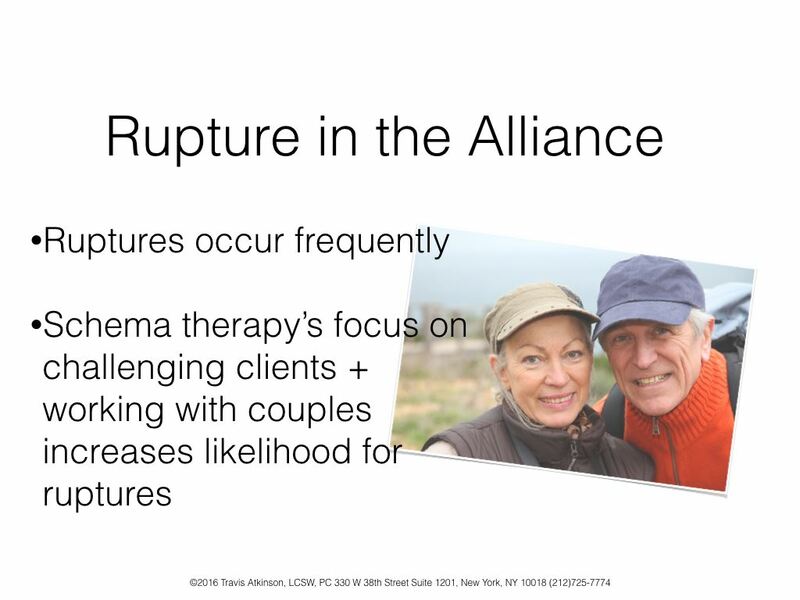 The therapist’s ability to “make sense” of ruptures in the therapeutic alliance may be one of the strongest influences to help anchor challenging partners in a couples dynamic. With effective monitoring and modifying, the schema therapist uses his or her healthy adult mode to stay emotionally present in the treatment room. The therapist attunes to each partner, and resonates with each client in the relationship so that the couple “feels felt” by the therapist. Curiosity drives each interaction by the therapist, understanding that each couple has its own culture, and the therapist is able to discover individual parts of each partner that make up the whole of the relationship. Caring from the therapist in a Healthy adult mode evolves from being curious, open, and accepting of each partner, regardless of modes that attempt to push the therapist away. Despite ruptures along the way, each partner learns through successful repair efforts to trust the therapist, the most powerful element in a relationship (Siegel, 2011). Trust develops in a therapeutic alliance when the therapist is open and connected with himself or herself, and able to consistently practice kindness and compassion with each partner so that spontaneity is not disrupted in the treatment room. When ruptures in the therapeutic alliance are repaired effectively by the therapist and each partner in a relationship, the couple learns to trust through what only experience provides: the ability to predict in a positive way how a caregiver will respond. Arntz, A. & Jacob, G. (2013). Schema therapy in practice. West Sussex: Wiley-Blackwell. Atkinson, T. (2012). Schema therapy for couples: healing partners in a relationship. In M. van Vreeswijk, J. Broersen & M. Nadort (Eds. ), Handbook of schema therapy. West Sussex: Wiley-Blackwell. Furrow, J.L., Johnson, S.M. & Bradley, B.A. (2011). The emotionally focused casebook: new directions in treating couples. New York: Rutledge. Gottman, J.M. & Gottman, J.S. (2014). 10 principles for doing effective couples therapy. New York: Norton. Gottman, J.M. (1999). The marriage clinic. New York: Norton. Norcross, J.C., Beutler, L.E. & Levant, R.F. (2005). Evidence-based practices in mental health: debate and dialogue on the fundamental questions. Washington D.C.: American Psychological Association. Norcross, J.C. (2011). Psychotherapy relationships that work. New York: Oxford. Siegel, D.J. (2011). The mindful therapist. New York: Norton. Simeone-DiFrancesco, C., Roediger, E. & Stevens, B. Schema therapy with couples: a practitioner’s guide to healing relationships. West Sussex: Willey-Blackwell.